The latest numbers from Mainstreet confirm the trend seen elsewhere while simultaneously adding to the already existing uncertainty. I say it confirmed the trend because, compared to the previous Mainstreet poll, we see the BC Liberals up, the BC NDP down and the the Green stable. This, except maybe for the Green, lines up with the trends observed in Ipsos and Justason. But the actual numbers are different. 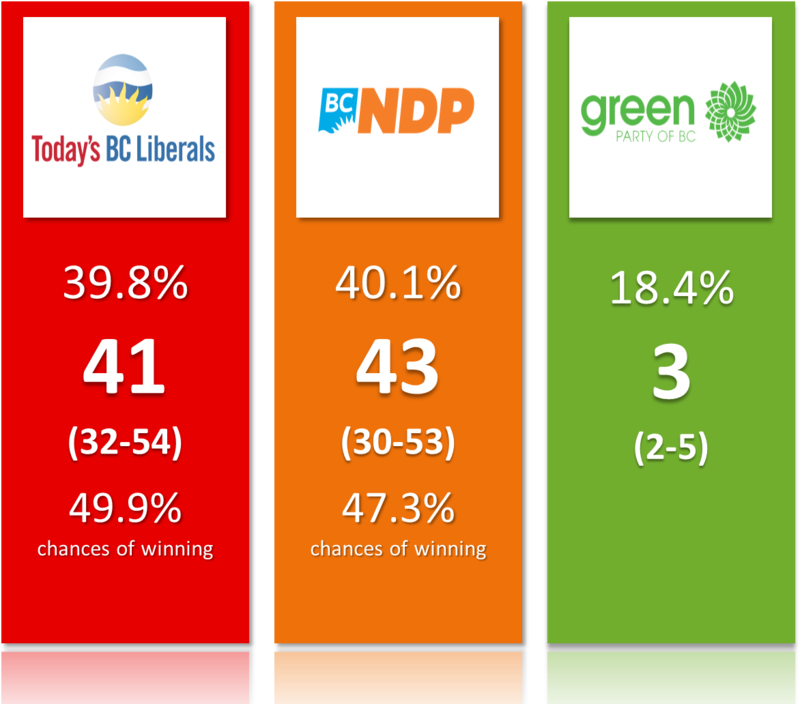 While the previous two polls had the Liberals slightly ahead, Mainstreet continues to show John Horgan and his party ahead (Note: yes, there was also this Forum poll with a huge NDP lead but I'm not including a poll that has the BC Conservatives at 7% because it makes no sense at all). So, are the polls just not agreeing with each other? Is it a simple question of online (Ipsos, Justason) versus IVR methodology? Maybe, but there is another possibility: they all have a share of the truth. Indeed, it's totally possible that the true voting intentions are around 39-40 for the main two parties and polls are simply varying because of the margins of error. Some polls will have one party ahead while another will show the opposite. If that's the case, doing an average should solve our problems. I actually think that this might be what is happening. Let's compare the latest Ipsos to this Mainstreet. Before the redistribution of undecided voters, Ipsos had Lib at 34, NDP at 33 and Green at 11. Mainstreet has, respectively, 31, 35 and 17. No question that the Green party is different, but let's focus on the top two. 34-33 vs 31-35 isn't fundamentally different. Given the sample sizes, that's actually perfectly normal. Personally, I'm not going to try to guess who is "right". It would be arbitrary (I could be lucky though). And I truly believe that the best description of the race is that it's very close between the top two. This theory is fully compatible with what we see in the polls (again, outside Forum), so that works for me. - Pollsters almost all agree regarding the NDP, it's the Liberals and Green that fluctuate. - The previous Mainstreet poll, with a NDP lead of 10 points, was likely an outlier. This one poll did create a narrative for the mid section of the campaign though. It's unfortunate that many polling firms are staying out of this BC race because they are scared. - The Greens have actually increased by 1 points among all voters in Mainstreet but dropped by 1 points among decided and leaning. It means this party dropped among the leaning voters (that aren't published by Mainstreet). It's kinda weird. I added this poll into the average and the projections have been updated, as you can see below. It's becoming fairly obvious that my final projections on Monday won't be able to pick a winner with a high certainty. That'd require a massive last minute swing (in favour of one or another) and we'd need last minute polls to pick it up. So just start accepting the possibility that next Tuesday's election will likely be the most uncertain in recent years. also, please notice that uncertain doesn't necessarily mean close. What it means is that based on the information we have, there are a wide range of possible outcomes. 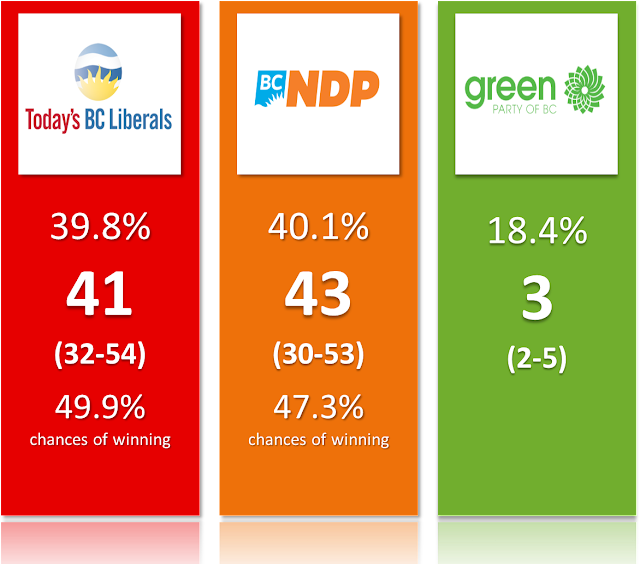 Yes, the projections are back to showing the NDP ahead but with lower chances of winning. It was already the case weeks ago. It isn't a mistake. This is happening because one source of uncertainty is the score of the Green party. If it outperforms the polls (or is very efficient on the Island), it'll win more than 3 seats and that will eat into the NDP's total. So this source of uncertainty -a significant one- is mostly affecting the NDP and not the Liberals. Therefore the seat total for the NDP is more uncertain and the chances are lower. Weird but logical after the explanation (at least I hope so). Speaking of the Green, they are stable but are still only projected at 3 seats. Yes the Green party will do much better than 4 years ago but that doesn't guarantee seats under our electoral system. I don't use regional numbers directly for my projections but I do follow them. The raw poll average on the Island has the Liberals 28.6%, the NDP at 39.6% and the Green at 29.3%. That only represents a drop of 5 points for the NDP that is still comfortably ahead. Of course, the Greens have chances in Victoria and around the city (mostly), so the percentages Island-wide aren't necessarily the most useful, but still. If the Greens are going to surge on the Island and win 5-6 seats, they'll likely need to be higher than 29% -and barely being ahead of the Liberals. Or they can stay at 29% and just concentrate their support in these 5-6 ridings. That works but it's harder and I can't really predict that. Maybe we focus too much on the voting intentions, the "top line" numbers. What about leadership and best Premier? Mainstreet has Clark at 33% and Horgan at 35%, Ipsos has 29 vs 26 respectively. Again, this is showing a tight race. Also, what about Google Trends? If we look for the parties since the beginning of this election, we see a tight race between Liberals and NDP. If you search for the leaders, Clark is still way, way ahead of the other two. Comparing to 2013, it seems the party searches are a better indicator but it remains that John Horgan simply isn't enough known and that might hurt the NDP at the end. Finally, the issues, you know, that thing voters pretend to really care about. Polls have shown Horgan to be more relatable ("sharing your values") and better than Clark on the top two issues of healthcare and housing. At the same time, Clark is seen as a better speaker, better for the economy and job as well as public finances. So there as well, it's mostly a wash. Maybe worrisome for Horgan, the Insight West poll shows that 53% of respondents don't know if he would be a good economic manager. It's better than thinking he'd bad but it's not great either. Undecided voters might care more about the economic stability of the province and that could give Clark the edge she needs to remain Premier. Anyway, as a conclusion, here are the detailed projections. As always, remember that you can make your own using the simulator.